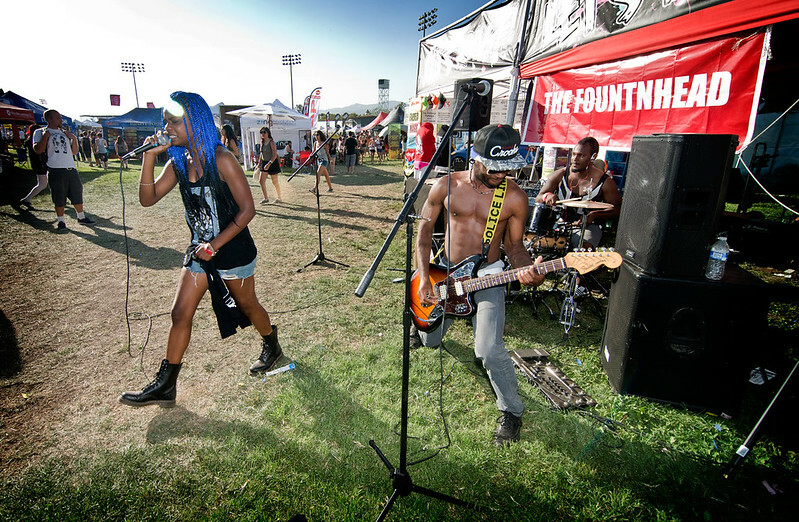 FountNHead performs at Vans Warped Tour in Pomona. Here's one of my favorite bands from this year's Vans Warped Tour at Pomona. One of the highlights of the day came from a band that didn’t play on any stage. Between the beer garden and the Spotify Stage, a band from Atlanta called FountNhead had one of THE best performances of the day. With a booth set up next to the main stage, FountNhead had surprise pop-up performances, racing in a few songs, against time, before the next band started to play above them. The trio, consisting of Jewel, Sainto and Nixon, echos the political, rap/rock sounds of Rage Against the Machine. Their song “As A Skunk” is an energized, fighting the machine anthem follwed by fist pumping, hard rockin’ beats peaked the interest of those walking by; enough so that a sizable crowd stopped to listen. I came back for seconds and thirds, knowing I’ll get to hear more songs each time I stopped by. Don’t miss these guys! Fountnhead will be playing the entire Warped Tour.